If you see one or two big rectangular solar collectors on a roof, it’s likely to be part of a solar thermal system for heating domestic hot water. Of all solar applications (with the exception of solar pool heating) heating water for washing is the one with the shortest payback. In northern climes, like ours, a solar hot water heating system must be protected from freezing, so Halco installs indirect systems, also known as closed-loop systems. In such systems, a non-toxic antifreeze circulates between the collectors and a heat exchanger, which heats the domestic hot water. Thermal collectors convert solar energy to heat. Radiation strikes the absorber plate and heat is drawn away by liquid or air. The heat may be used immediately or stored for later use. 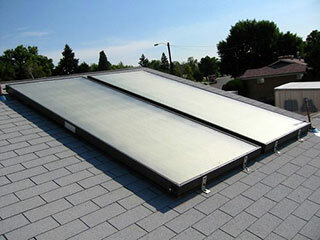 In solar hot water heating systems, a tank stores the hot water. In the case of swimming pools, the pool acts as the storage tank. In solar space heating, the heat may be stored in large tanks of water or in some type of masonry, including bins of stone. Contact us for a Free Estimate and start using solar-heated water in your home. Glazed, flat-plate, liquid-cooled collectors look like a rectangular enclosure, about the size of a sheet of plywood, typically 4- to 5-in. thick, with a glass cover on top. Inside, beneath the glass cover, is a blackened absorber sheet with integral passages through which a liquid flows to draw away the sun’s heat (hence the term “liquid-cooled”) from the collector. The enclosure is insulated on the sides and back. Tubing projects through the collector enclosure so it can be connected to additional collectors and to the supply and return mains. Glazed, flat-plate collectors are widely used for domestic water heating. They may also be used for space heating. The liquid that circulates through the collector is usually water or antifreeze. Provisions must be made to deal with the overheating of the liquid when there is no demand for heat. If water is used, provisions for freezing must be made. Unglazed, flat plate, liquid-cooled collectors are well suited for low-temperature applications, such as those used to heat swimming pools and spas. They are typically extruded from a polymer and include a series of tubes through which the liquid to be heated can be pumped. Almost all are flexible. Evacuated-tube collectors are liquid-cooled. They typically consist of a series of individual evacuated glass tubes. Inside each evacuated tube is the absorber. The heat transfer liquid removes heat from the absorber and delivers it to the piping that serves the collector. The use of evacuated-tube collectors has increased in recent years, but they still represent a small percent of today’s market. Like liquid-cooled flat plate collectors, evacuated-tube collectors may be used for heating domestic water or for space heating. Glazed flat plate, air-cooled collectors look like a rectangular enclosure, about the size of a sheet of plywood, 6” to 8” thick with a glass cover on one side of the enclosure. Inside, beneath the glass cover, is a blackened absorber sheet with integral passages through which air flows to remove the sun’s heat. The enclosure is insulated on the sides and back. Gaskets or fittings are provided on the sides of the enclosure to minimize air leakage as air flows from the absorber of one collector to the absorber of the next, when the system is collecting heat. Flat plate air-cooled collectors are used for space heating. There’s not a lot that can go wrong with them because freezing and overheating are not issues. The reliability of the systems in which they are used is usually quite high. Contact us today and we'll gladly answer any and all of your questions about solar thermal systems. We offer Free Estimates for solar thermal work in Ithaca, Rochester, Syracuse, Webster, Fairport, Auburn, Cortland, Canandaigua, Pittsford, and the surrounding areas including Geneva, Penfield, Brockport, Hilton, Spencerport, and more!